Moms, dads and schools are grappling with how to talk with their kids about the popular new Netflix series "13 Reasons Why," the story of a suburban teen who dies by suicide and leaves behind 13 recordings for the people she says were the reasons she killed herself. The tapes encapsulate everything from betrayal to romantic relationships gone bad to bullying to sexual assault. The show is graphic, culminating in fictional teen Hannah Baker's suicide scene in the last episode. It's rated M for mature viewers, but ask any high school student (and most middle school kids, too) and it's likely you'll hear they've watched it or heard all about it through friends and social media. Some mental health professionals are warning that teens shouldn't view it, especially those struggling with depression or with a history of suicidal thoughts or behaviors, but it may be too late for some parents whose children have already watched on their own. If your child has seen the show or is curious about it, Dr. Christine Moutier, chief medical officer of the American Foundation for Suicide Prevention has some advice: "Offer to watch it with them," Moutier told CBS News. But she says it's not for every teen. "I would watch it if your kid is in a solid state of mental health. If you have a kid who is struggling or is some years out from a mental health issue -- anyone who's had a suicide attempt or become suicidal -- they should just stay away from this show," Moutier said. Kids with a genetic risk factor for depression or a family history of suicide are also vulnerable to the show's messaging and imagery, she said. 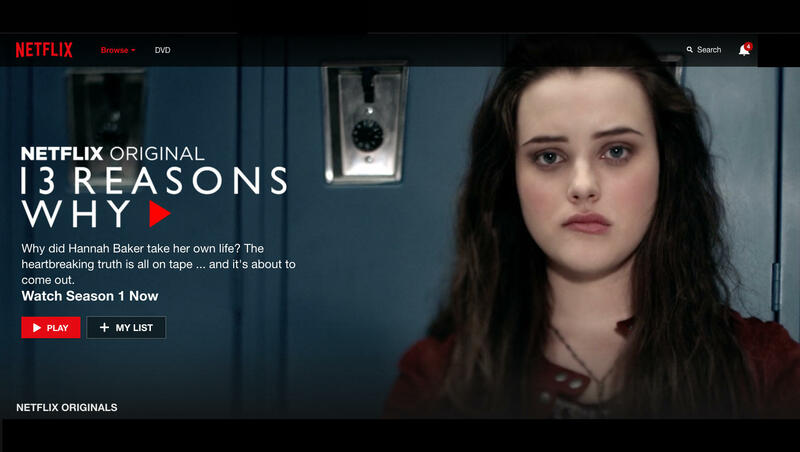 The mysterious nature of the series -- the viewer follows teenager Clay Jensen as he listens to each tape, uncovering bit by bit the story behind Hannah's decision to end her life -- may make it tempting to watch all 13 episodes in one fell swoop. But avoid binge-watching it, Moutier recommends. "Approach it in a tiered way by watching one episode every so often. Binge-watching anything is just going to flood your brain," she said. A mother of two teenagers, she said her own daughter was interested in seeing "13 Reasons Why." "My daughter had already read the book before I knew anything about it," she said. So they are watching it together. Knowing it had graphic sexual assault and suicide scenes, they agreed beforehand that they'd fast-forward through those parts. "With my own daughter, she and I have already agreed we will figure out where those scenes are and not look at those," said Moutier. Any teen who's experienced a sexual assault should avoid the show, she advised, saying, "Those scenes will be very triggering." Parents should shore up their knowledge about suicide prevention before watching "13 Reasons" with their teen or talking about it with a child who has already seen it, so they're prepared to respond and answer questions. The American Foundation for Suicide Prevention offers information online about risks factors, warning signs to watch out for, and where to find resources for support and treatment. The Jed Foundation created a page specially tailored to the show with talking points that teens, parents, school counselors and mental health professionals can use to help them process the series' content with young viewers. Heather Freed, the executive director of Erika's Lighthouse, a non-profit resource for depressed teens, told CBS Chicago that 12 school districts in the Chicago area have reached out to the group for help on how to talk with families about the program. "I think a lot of people are afraid about what to do and doing the wrong thing," Freed told the station. So the group created a resource guide for schools and families to help them navigate the difficult emotions the program might stir up. The best way to talk with your kids about what they think of the show and the topic of suicide is to listen first in a non-judgey way, Moutier said. "Learn how to have a caring conversation. Don't do all the talking. Ask open-ended questions like 'What did you think of it?' Don't judge. And do not offer quick solutions or fixes. Listen, support, and if your child is talking about any level of stress, do not hesitate to ask them if they are having suicidal thoughts," Moutier said. "Don't assume one way or another. If a teen will just start talking about their reactions to it, I think the parent might learn a lot about both what their child took away from the show as well as their own internal thoughts about it," she said. If your child is having thoughts of suicide, you can reach out to a local chapter of the American Foundation for Suicide Prevention, a national suicide organization or hotline. Most areas also have youth counseling services with experts in suicide prevention. Schools and churches can be a resource, as well. "13 Reasons Why" has some danger points parents should be aware of, Moutier added. Some teens may take away a disturbing message that suicide is presented as an acceptable solution. "When the person is glorified and has achieved getting a message out loud and clear after their death, when there is vengeance and blame involved, those all go down a path that detracts from the facts of suicide. To point fingers and blame really misleads the public," said Moutier, referring to the fictional tape recordings the character Hannah left behind, which figure into each of the 13 episodes. Early in the show, Hannah's locker is decorated with photos and messages from other students memorializing her. At one point, two girls come by the locker, one saying how pretty Hannah was, and they take a selfie of themselves in front of it. "From a population standpoint, we would be better off not to expose ourselves to messaging like this that is graphic, sensationalized or glorified suicide. It could raise the potential for copycats or clusters of suicides," Moutier said. Experts on teen suicide advise schools to be cautious about the messaging they send after a child's suicide, including the monitoring of memorials and allowing kids to grieve and debrief before launching into suicide prevention activities. The way adults are represented in "13 Reasons Why" ranges from generally clueless to unhelpful to out-and-out harmful, including the school counselor and parents. But Moutier said it's not true to real life when most kids who are suicidal reach out for help. "There's been research that shows clearly that suicide risk goes down in youth when there is a strong belief that there are adults in their community who are supportive and trustworthy," she explained. When it comes to the series' graphic finale, Moutier sees the potential for serious harm. "No matter how much you try to defend a graphic portrayal of suicide to raise awareness, there is no way it will change the very real and dangerous suicide risk among the population that is vulnerable. It's very tempting to use that kind of graphic portrayal, thinking you won't be able to drive your point home if you don't, but it's a harmful message." Some teens may be desensitized to that type of disturbing or violent imagery, while others will be much more deeply affected. "If you have any say in it, I would not expose a vulnerable child or adult to it -- period," said Moutier. Kids struggling with suicidal thoughts need to hear that suicide is not a solution to life's challenges, Moutier said. "There are solutions but they might be hard for that person to access. Others can help them get through it and help them access those," she said. Actress and singer Selena Gomez -- a former Disney Channel star who has spoken out about her own struggles with anxiety and depression -- served as an executive producer for the Netflix series, which is based on Jay Asher's young adult novel. She and the actors from the show talk about suicide in a follow-up video, "13 Reasons Why: Beyond the Reasons," for teenagers who are battling depression. The bottom line, said Moutier: "Don't be afraid to have a conversation with your children."